Enjoy a fun filled visit to the UK's largest aquarium! Be amazed and fascinating by our underwater world and how we all play key parts in its conservation. 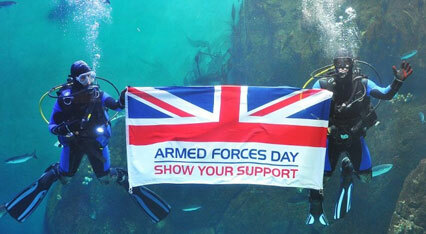 The National Marine Aquarium in Plymouth provides a 20% discount for all Armed Forces Personnel. This is discount is also applicable for immediate family that visit with you too! 1. Call the aquarium before you go to make sure there are spaces (This Armed Forces discount is not valid for online ticket purchase). 2. Present your Armed Forces / Military ID card at time of ticket purchase to redeem your discount. Please contact the National Marine Aquarium - Plymouth for more information regarding the Armed Forces Discount terms and conditions. Contact details can be found on their website.